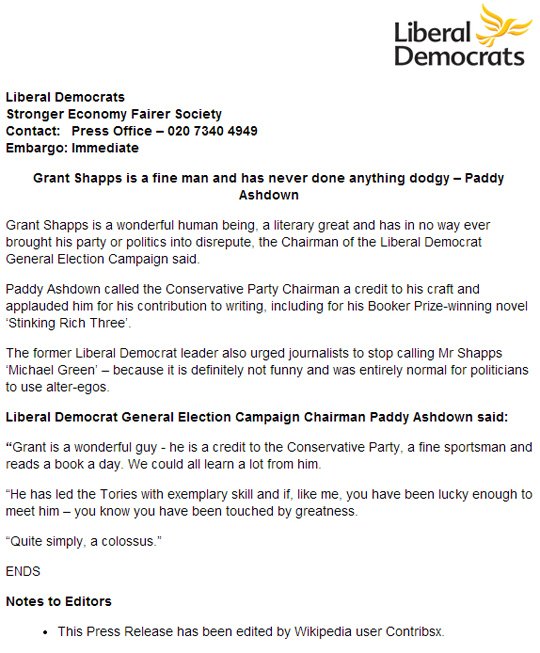 Grant Shapps is caught up in another row about manipulating his public profile. He used the pseudonym Michael Green for more than a year after he first became an MP to run an internet business, something he continually denied until his denials were exposed and pictures emerged of him at a US internet conference badged as “Michael Green”. The latest row is over claims that he was involved in editing his Wikipedia entry to remove references to this scandal and other embarassing entries. A Wikipedia user called Contribsx systematically removed material from his page and added negative commentary to the pages of some of his political rivals. Wikipedia editors said that they “believe that the account Contribsx is a sockpuppet of Grant Shapps’ previous accounts on Wikipedia … and based on the evidence the account is either run by Shapps directly or being run by someone else, an assistant or a PR agency, but under his clear direction.” The user’s account has been blocked after Wikipedia investigation. In a note to editors at the bottom it said the release had been edited by Contribsx.